Your living room could become a fictional space rebellion this holiday season. 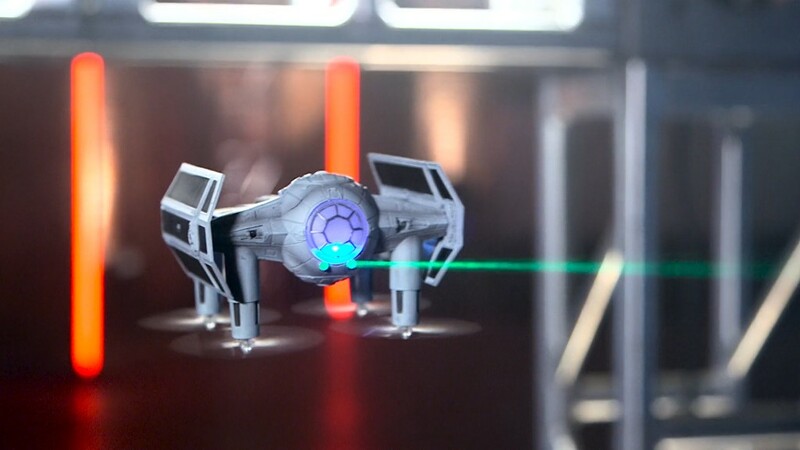 Propel's new Star Wars battle quad drones put high-flying combat in the palm of your hand. You can fly three ships from the "Star Wars" saga -- the 74-Z Speeder Bike, T-65 X-Wing Starfighter and the Tie Advanced X1. Drones are operable up to 200 feet away. But with just six minutes of battery life, the battles won't last as long as those in space. The quadcopters come with an extra battery in collectible illuminated boxes that play themed music when open. At a demonstration in San Francisco on Wednesday, I watched the T-65 X-Wing Starfighter and the Tie Advanced X1 duke it out in mid-air. Like starfighter pilots, players can shoot lasers at an opponent and chase other ships at up to 35 miles per hour. The controller connected to the drone monitors the number of shots and kills, and plays "Star Wars" music while you fly. Saw some Star Wars drones fight today. Activity data will be shared with a Propel app, launching in a few weeks. Pilots' kills and rankings will be uploaded to a global scoring system. The app will also feature a flight simulator to let players learn the controls before flying the ships for real. Hovering and flying are entertaining, but the drones are designed to do battle. Made out of flexible polymer, they can bang around without breaking. "They are designed for running into each other," Propel drone pilot Kyle Dahl told CNNMoney. "That's the one thing we've tested a lot. Beating them up." The drones will be available on Friday for $239 each. Next year, Propel plans to launch a Millennium Falcon drone, too.